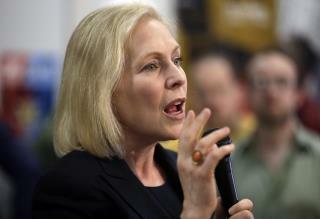 (Newser) – New York Sen. Kirsten Gillibrand formally joined the 2020 White House race on Sunday and previewed the hard line she will take against President Trump by announcing a rally outside one of his signature Manhattan properties. She had spent more than a month traveling the country to gauge support for a run, reports the AP. Her announcement that she was joining the dozen-plus candidates who want to challenge Trump came in a nearly three-minute video released early Sunday. She says the national anthem poses this question: "Will brave win?" "Well, it hasn't always, and it isn't right now," she says. "Brave doesn't pit people against each other. Brave doesn't put money over lives. Brave doesn't spread hate. Cloud truth. Build a wall. That's what fear does." In the video, Gillibrand says the country needs a leader who "makes bold, brave choices" and "someone who isn't afraid of progress. That's why I'm running for president." She said her debut speech as a candidate will come next Sunday in front of the Trump International Hotel & Tower in New York. Gillibrand has been one of the most forceful critics of the Trump administration, and using the backdrop of one of Trump's marquee properties is a clear challenge to the president. She announced her exploratory committee in January on the Late Show with Stephen Colbert. Since then, she has visited a number of states to assess support for a White House bid. This week she plans to campaign in Michigan, Iowa, and Nevada, leading up to her New York kickoff. All this attention on who is running for the democratic candidate. Is there going to be ANY gop running against trump at all?